BHA, Saudi Arabia - At the Islamic Law department here at King Khalid University, students line up to buy cassette tapes and printed pamphlets from militant Islamic clerics whose sermons burn with anti-American sentiment and ``fatwas,'' or religious decrees, declaring holy war against infidels. At a public high school in this provincial town in the southwest part of the country, 10th-grade classes are forced to memorize from a Ministry of Education textbook entitled "Monotheism" that is replete with anti-Christian and anti-Jewish bigotry and violent interpretations of Islamic scripture. A passage on page 64 under the title "Judgement Day," says: "The Hour will not come until Muslims will fight the Jews, and Muslims will kill all the Jews." These two vignettes offer a glimpse inside an education system in Saudi Arabia that US diplomats, academics, and some Saudi education officials suggest is fostering a volatile mix of intolerance, rote learning, anti-Western bias, and a religious call to duty too often misinterpreted as holy war. US and some senior Saudi officials seem to agree that the education system needs reform and that the control the kingdom has given to the fundamentalist Wahabi religious institutions to shape it needs rethinking. But the more divisive question between the awkward Saudi and US allies is what role the system itself may have played in shaping the beliefs of Osama bin Laden's followers -- specifically the 15 young Saudi men who joined his Al Qaeda network to carry out the Sept. 11 attack on America. These Saudis comprised 15 of the 19 hijackers who seized control of the four planes which crashed into the World Trade Center, the Pentagon, and rural Pennsylvania. King Khalid University and the Abha public high school are set along the road that winds through the provinces of Saudi Arabia's southwest, a region from which 12 of the 15 Saudis came. Several of the young men attended the university and were, friends and family say, known to have recently tapped into the militant Islamic culture fostered by the tapes and pamphlets of clerics such as Eid Al Guerney and Safar Al Hawali, both of whom come from the southern province of Asir, and whose sermons often dovetail with the preachings of bin Laden. Virtually all of the young hijackers would have attended the often rundown and overcrowded public schools in the southwest where the 10th-grade textbook on monotheism authored by another hardline Muslim cleric, Sheikh Saleh Al Fawzan, was routinely used. But the tapes of Al Guerney and Al Hawali or the textbooks of Al Fawzan are not unique to the schools of southwest Saudi Arabia. The tapes and pamphlets are available throughout the kingdom, and the textbooks are a standardized part of the national curriculum. 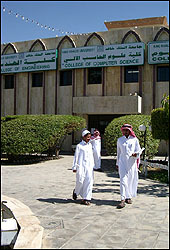 US diplomats and Saudi specialists say Saudi schools are the foundation of the broader society in which the House of Saud has for decades tolerated extremists within the religious hierarchy to set a tone -- in schools as well as on national television and radio airways -- of open bigotry toward non-Muslims, contempt even for those non-Sunni Muslims from other branches of the faith such as the Shiite, and of virulent anti-Americanism. This, US and Saudi observers here say, has been part of an unofficial deal: The kingdom gave the religious establishment control of the schools as long as it didn't question the legitimacy of the monarchy's power. The United States went along with this tacit agreement as long as the oil kept flowing, its troops stayed in the country, and the House of Saud remained on the throne. The deal has spawned a society where the call to "jihad" in the fight against the Soviet occupation of Afghanistan, and later alongside Muslim rebels in Bosnia and Chechnya, has been promoted as adventurous and heroic. Youths have been encouraged to go and fight not just by extremists, but by clerics who exist within the religious establishment. In addition, the charitable networks that fund relief in Afghanistan, Bosnia, and Chechnya, and which are often conduits for volunteers to fight there, are frequently headed by boards of directors that include members of the most respected Saudi families. This was the door of entry to jihad for most of the 15 Saudi hijackers, officials say, and once in that door, the path they chose led to Al Qaeda. Ali Al Ahmed, the Saudi-born executive director of the McLean, Va.-based Saudi Institute, a nonprofit organization that promotes tolerance and human rights in Saudi Arabia, is set to release a report this month that will offer a scathing indictment of the religious hierarchy's dominance over Saudi education, and the impact it has had on Saudi society. There is a method of teaching that "manipulates messages of Islam" to call for fighting jihad against "the enemies of Islam," Al Ahmed said. The complexity and shades of meaning of concepts such as jihad, which literally translates as "struggle" and can be interpreted as a personal struggle to be a good Muslim, is often lost, he added. For example, the teaching on jihad is often "fused with lessons on current events of Israelis shooting Palestinian children and babies dying in Iraq because of US sanctions," Al Ahmed said. Then, "Saudi kids are just set out on a path of thinking, `OK, those are our enemies,' and in some rare cases they take action. "The system has got to be more careful with what it is teaching, who is teaching it, and how it is interpreted," said Al Ahmed, who is from the Shiite branch of Islam and particularly concerned about what he calls "wrongful" teaching about this minority sect within the kingdom. "The schools, and other activities like the religious summer camps the monarchy sponsors, contribute to attitudes that shape young people. "Bin Laden and these hijackers are all products of this," he said. Saudi officials insist the 15 Saudi hijackers are nothing more than a handful of extremists from the furthest fringe of a population of 16 million. "Al Qaeda is a tiny cult, not a movement," as one palace official put it. But the same officials do not deny that there appears to be widespread support for bin Laden's ideas among youth inside the kingdom -- a fact that alarms them since bin Laden calls for the monarchy to be overthrown. As he sees it, it has "desecrated the land of the Two Holy Mosques" by allowing "infidel" US military forces to be based in the country. Said Al Harthi, senior adviser in the Interior Ministry, confirmed that officials were surprised that the ministry's own targeted survey of several hundred educated people between the ages of 25 and 40 found that 90 percent of the sample expressed support, on some level, for bin Laden. But Al Harthi points out that the survey was taken in November at a particularly emotional time when Saudis were watching television images of the US bombing in Afghanistan and feared massive civilian deaths. "That did not indicate support for bin Laden's cause as much as a rejection of the US bombing," said Al Harthi. Still, in interviews with dozens of young Saudis throughout the kingdom, it was common to hear students articulate not support for the attacks on Sept. 11, but certainly agreement with bin Laden's tirade against American support for Israel, and against the US military presence in Saudi Arabia. Many viewed bin Laden as a folk hero, and seemed indifferent to the fact that the terrorist strikes had killed nearly 3,000 civilians, including hundreds of Muslims. In Riyadh, a 20-year-old engineering student at King Saud University who would give only his first name of Salem, offered a common point of view. Sitting at a McDonalds at the Al Faisaliah Mall, a shopping center catering to Saudi's elite, he said, "I support bin Laden because he is standing up to America. If you ask every young person here you will hear the same. America allows Israel to kill Palestinians and no one says anything. At least bin Laden does." Salem was wearing a UCLA baseball cap with a classically American fold to the brim and a Ralph Lauren polo shirt. Asked if he had ever been to the United States, he replied, "No, my brother studied there. But I'd love to go. It's a great country. Do you think it's still possible for us to get visas?" This disconnect -- young people trashing the US and singing the praises of bin Laden, but still admiring the opportunities and freedom that America offers -- proved common through two weeks of interviews around the country. The US-Saudi relationship has always been a perplexing one filled with inconsistencies, and a reluctance by either side to ask too many uncomfortable, searching questions of the other. But in the bitter aftermath of Sept. 11, Washington is beginning to ask at least some questions about the kingdom's education system and the religious establishment that plays such a role in shaping Saudi youth. "This is a problem. It needs to be dealt with, and the place to start is the schools," said Edward Walker Jr., president of the Middle East Institute, a Washington-based think tank. Walker has had several diplomatic postings in the Middle East including Saudi Arabia from 1984 to 1987; and he has served as the US ambassador to Egypt and Israel. "There has been a tendency to blame Wahhabism, but it is a mistake," said Walker, referring to the puritanical stream of Islamic thought to which the House of Saud belongs and which it fosters throughout the country. "Just because they are fundamentalists does not mean that they are prone to anti-American sentiment or to terrorism. The problem has been how these ideas are communicated within the schools by the teachers.... It is also because the economic decline in the kingdom has resulted in fewer students studying abroad, and the youth are becoming more insulated, and less worldly, resistant to modernity, and so their Islamic identity becomes directed in an anti-Western way.... The youths involved in Sept. 11 would have to be looked at in that light." Amid increasing US calls for reforms after Sept. 11, the Saudis are reexamining their education system. The debate has become intense in recent weeks inside Saudi Arabia, with deep theological and pedagogical lines being drawn over how best to revamp the system, and the hardliners sharply criticizing the movement as a Western plot to undermine the Islamic purity of the state. The hottest issue for the Saudi reformers is not the anti-American sentiment, but rote memorization of Islamic texts, which they argue is producing a generation with little capacity for critical thinking and taking time away from the development of other skills needed to keep pace with the technological age. A case in point: On a recent afternoon at the Al Darrah public school in Abha, the religion teacher, Abdel Karim, 35, was calling on students to recite from memory the teaching of the night before. It was a two-hour lesson on the restrictions pertaining to hunting during the hajj, or pilgrimage season. He asked questions, and the students shot up their hands and dutifully repeated the passages word for word from the textbook. It didn't matter that none of the children had ever hunted, or that none of their fathers had. It was thought that the value in the lesson was to memorize what they were told, not to apply the religious teaching to their lives. "They approach teaching on the Koran and its messages as if it was the 7th century, as if time was suspended," Ali Ahmed said. "And that's why you get not only these exercises in absurdity, but also wrongful and dangerous teaching on the call for jihad." Education Minister Mohammed bin Ahmed Al-Rasheed, who has led the call for overhauling the schools and moving away from rote learning of the Koran, recently complained the education system was producing "parrots." But Al Fawzan, author of the controversial 10th-grade textbook on monotheism and one of the staunchest religious conservatives in the education system, has blasted the advocates for change. Al Fawzan declined to be interviewed, but in a Feb. 11 article in the Saudi newspaper Al Jazeera, he reflected the venomous tone behind this debate. "The Jews and Christians and the polytheists have shown their heartfelt hatred and try to prevent us from the true path of God," Al Fawzan wrote, according to a translation from the Arabic. "They want to change our religion and our teaching to disconnect us from Islam so they can come and occupy us with their armies. It is bad enough when it comes from the infidels, but worse when they are of our skin. They say we create parrots, but they are the real parrots repeating what our enemies say of Islam." Saudi education officials insist they began this overhaul at least three years before the Sept. 11 attacks. Khaled Al Soultan, deputy minister for higher education, said that his ministry is about to release a long-awaited study on the education system that will recommend changes. But he said that the rapid growth of Saudi Arabia has to be factored in to any criticism of the system, and cautions against Western arrogance, noting, for example, that Christian fundamentalism has preached its own brand of intolerance. At least 65 percent of the Saudi population of 16 million (not including the six million foreign workers in the country) is under the age of 25. A nation with one of the world's highest birth rates is putting almost unbearable strain on its entire education system. Al Soultan complains that the recent criticism of Saudi education often overlooks considerable successes, including a literacy rate that in just two generations has gone from as low as 25 percent to over 90 percent today. The monarchy, he said, has also developed a massive and heavily subsidized higher education system. In 1970, a handful of universities graduated 2,500 students a year, and now campuses across the country graduate 200,000 annually. Tuition is free for Saudi citizens and stipends are provided for textbooks and meals and housing. While there are many graduates, more than one third cannot find jobs despite their degrees. Many of those who do are unsatisfied with the position. "We have been struggling, yes," Al Soultan said. "But to say that our education system somehow contributed to those hijackers who boarded the plane is outrageous." Still, Washington and Middle East observers have connected the failings of the education system to what some believe is a surging reservoir of anger, alienation, and intolerance among Saudi youth. And it is undeniable that since Sept. 11, the reform debate on Saudi schools has flared dramatically. US diplomats are actively urging change, but also worrying that if they push too hard for what even many Saudis acknowledge are much-needed reforms the moves will be attacked by the religious establishment, painted as American colonialism and therefore doomed. "We have to tread carefully here," said one Western diplomat. It would make sense for the United States to be part of the solution, critics say, since it was clearly part of the inception of the problem. The history of the United States supporting Islamic fundamentalism goes much deeper than just the CIA involvement in Afghanistan. Since the late 1960s, the United States at points encouraged, and at other points did nothing to contain, the fundamentalist clerical establishment's monopoly on the school system, according to Saudi education specialists. In the 1970s, when profits from the oil boom were being turned to building an education system, a fundamentalist curriculum was seen by the United States as favorable in the Middle East context of the Cold War. God-fearing Muslims were preferable to godless communists, as the thinking went in Washington. America even encouraged the Saudis to import teachers from Egypt, Sudan, and Syria, including members of Islamic movements such as the Muslim Brotherhood and radical clerics such as the blind Egyptian Sheikh Omar Abdel Rahman, who would later be convicted of coordinating a foiled terrorist plot in New York City. It was an approach that some in favor of change suggest infected the education system with a virus that has now overtaken it. In the '80s, the United States again sought an alliance with the Saudi fundamentalists in its proxy war in Afghanistan against the Soviets. It was not just the CIA that was funneling billions of dollars to the Muslim resistance, or "mujahideen," to fight the Soviet occupation of Afghanistan. It was also Saudi Arabia that was matching the US funding. Bin Laden's involvement as the leader of Arab volunteers in the jihad in Afghanistan began at this time. The Soviet defeat in Afghanistan presaged the collapse of the USSR, but the United States and the kingdom still chose not to challenge the religious hierarchy in Saudi Arabia because of the critical role it would play in allowing the United States to use Saudi Arabia as the staging area for its war against Iraq. After the war was won, thousands of US troops stayed on in Saudi Arabia, and again the United States did "very little to rock the boat," as former Ambassador Walker put it, because Washington wanted those troops to stay there. Mohammed Al Zulfa is the representative from Asir on Saudi Arabia's 120-member Shura Council, a deliberative body handpicked by the monarchy. An advocate of change in education, Al Zulfa said: "We were politically naive. We knew we didn't want the communists teaching our children, but there was a threat we didn't think of that was growing -- a hijacking of our own faith. "But I have a question for you. Throughout all those years, where was your government, your CIA, in telling the government of Saudi Arabia that this direction needed to be stopped? Isn't that what a friend is for, to tell the truth, to give good advice?" This story ran on page A1 of the Boston Globe on 3/4/2002.